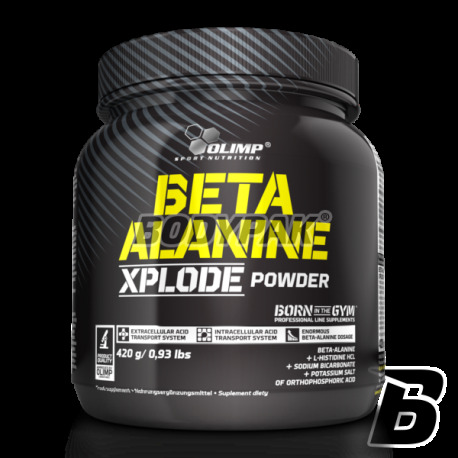 Beta Alanine Xplode Powder - Xplode ™ is a series of supplements based solely on an absolutely innovative products, designed for those with uncompromising demands. The unique composition of these supplements is the result of efforts of scientists from laboratories Olimp®, based on the design of each product, on the latest research in the field of diet and supplementation of athletes and active people. Many years of experience in the industry Olimp® supplements, undoubtedly contributed to the success of the most successful athletes from the Olimp Team, who also participated in creating the Xplode ™ series. The innovative composition of each product from the Xplode ™ series is based solely on the most effective and pharmaceutically pure active substances with proven and documented, safe operation. No cheap substitutes! Xplode ™ is a series of products with very high solubility and sensational, intensely fruity, aromatic flavors that you can freely combine and compose their own discretion. The use of maximum micronisation of loose forms is a component of the perfect absorption of active ingredients of each product of this unique series. 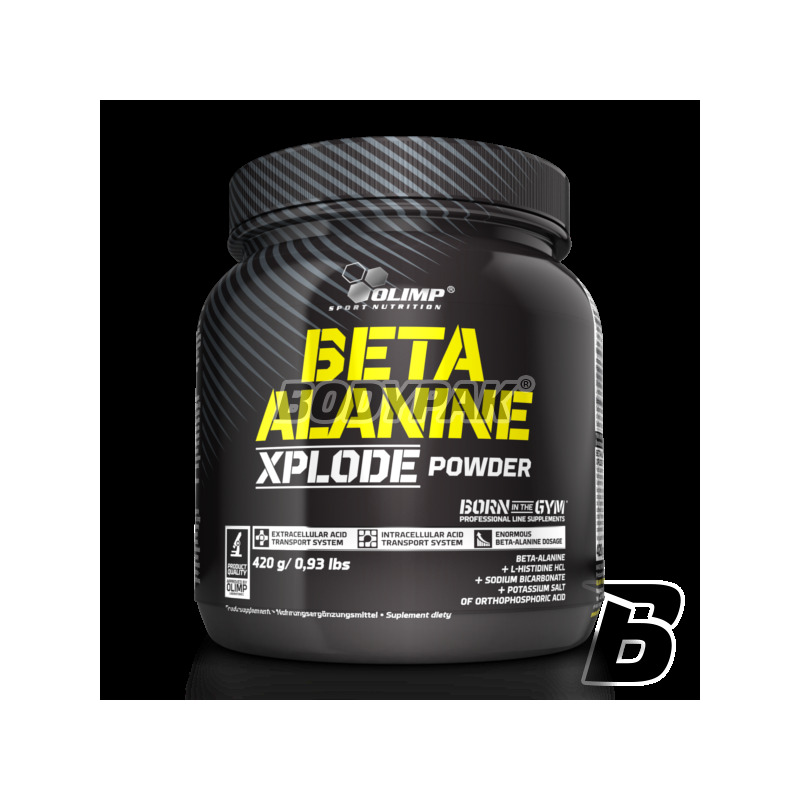 Ingredients Beta-alanine Xplode Powder® have been selected to act synergistically in the direction of increasing the volume of training, both for the duration of exercise, and the applied load at maximum shortened intervals riggings. There are studies that have investigated the impact of simultaneous supplementation with creatine and beta-alanine, among others, the level of testosterone, growth hormone or IGF-1, and the results suggest that it is precisely the use of the combination of these two components produces the best results in terms of improving strength endurance, increases in lean body mass while reducing body fat, creatine is also responsible for transport groups phosphate in the cell, the locations of the current demand for ATP, contributing to the efficient synthesis of vitamin B6 is involved in amino acids and efficient acquisition of fats and carbohydrates essential substances for the subsequent synthesis of ATP contributes to proper formation of enzymes and hormones, and an effective the nervous system, vitamin B6, also increases efficiency of absorption in the small intestine of the other ingredients blendu Beta-formula RUSH workout. Giving the potassium salt of phosphoric acid and L-histidine, created a double buffer "phosphate-prekarnozynowy" prevent adverse changes in intracellular environment, which provides a stable and high performance ATP synthesis. The formula uses ingredients that ionized form a basic buffer system blood, allowing the efficient transport of muscle cells to organs excreting waste products, acidic H + ions. What about the fact that your muscles have a huge inventory of glycogen, since during the training cells are not able to maintain a stable environment for the intracellular synthesis of the energy of this polymer. This is because beta-alanine is indispensable during intensive efforts. Together with L-histidine formed after carnosine, which shows great potential for antioxidant and may delay the degradation processes occurring in the cell during intensive. But even its potential under extreme conditions can be limited. Therefore, support its activities through integrated product substances act as intra- and extracellular buffering systems excess acid H + ions allows the realization of extreme effort for a much longer time. Hoffman J, et al. Effect of creatine and beta-alanine supplementation on performance and endocrine responses in strength/power athletes. Int J Sport Nutr Exerc Metab. 2006 Aug;16(4):430-46. Świetny produkt ! Warty uwagi ! Dobra cena ! Produkt bezpieczny i wysokiej jakości, wzrost siły i przyspieszenie regeneracji zauważalne po ok. 2 tygodniach regularnego stosowania, smak ananas bardzo dobry. Polecam. Świetna wersja beta-alaniny w proszku. Duży plus za wyśmienity smak, mały minus za wysoką cenę.